Update, 11/15/2014: The FBI is saying that the aerial video footage that Raymond “Shrimp Boy” Chow’s lawyers initially claimed was from a drone, was in fact shot from some kind of “manned aircraft,” FBI Special Agent Greg Wuthrich said to the San Francisco Chronicle on Friday. “What I can say is that during the (Yee-Chow) investigation, zero drones were used,” he said in an unusually transparent response to the drone claim by Chow’s lawyers. The Justice Department does not typically discuss with the media ongoing investigations, which the Yee-Chow case is classified as, and the FBI did not contest any of Briggs’ other claims about the surveillance tool’s capabilities. Hovering at altitude of 6,000 feet, and circling a residential neighborhood in the East Bay, above a cul-de-sac, the video footage runs for approximately an hour in broad daylight. Since Briggs filed his court documents, and after examining more video footage, he said that the altitude was approximately 6,000 feet versus the 650 feet he wrote in a court document filed at 1:08 AM on Wednesday. The onboard camera was able to zoom in “extremely close” on front porches, target vehicle license plates, and objects on the ground. The footage also includes a target GPS location, and there was no human involvement “observed at any point,” according to Briggs’ court filing. An anonymous source — who also has seen the video footage, which is part of the evidence that remains under a gag order signed by federal magistrate Charles Breyer — said to the Chronicle that some of the footage followed Michael Mei, whose parents were arrested in 2012, but not charged with any crimes. Mei is one of the now 28 defendants (Wilson Lim has died since the feds announced initial charges in March) in the sprawling federal investigation into political corruption and organized crime. Mei allegedly supplied the criminal element of the Ghee Kung Tong, the fraternal Chinese organization Chow chaired, with weed, which was then sold and the profits laundered. 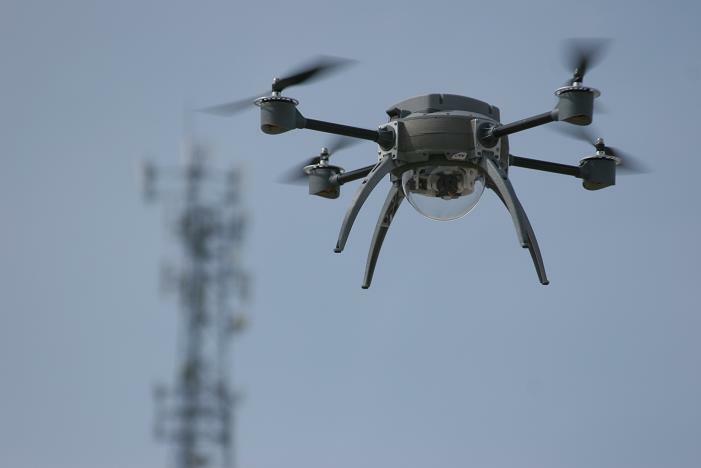 Despite the FBI’s claim that the aerial video footage was not filmed by an Unmanned Aerial Vehicle (UAV), Briggs insisted to the Chronicle that the source was less important than the potential civil rights violations of aerial surveillance activity. The FBI’s use of drones, which has been going on since at least 2006, has been marked by controversy in terms of exactly how and why they are used — potentially raising civil rights issues. Also, the FBI has said that drones’ use doesn’t require the paperwork that phone taps, and other types of surveillance requires. The news of the FBI’s use of aerial surveillance in the investigation comes amidst an important moment in the court proceedings. During an hour long Wednesday court hearing, Judge Charles Breyer denied several motions to sever the case into smaller pieces, reaffirming that the government has correctly charged the case in one, 228 count indictment. Judge Breyer also said that he expected the two defendants charged in the political corruption conspiracy, Keith Jackson and Leland Yee to go to trial in “early 2015” ahead of the second group of RICO defendants, which include Shrimp Boy and other members of the Ghee Kung Tong implicated in the alleged conspiracy. 29 people have thus far been implicated by the feds, including suspended state Sen. Leland Yee, and Chinatown association leader Raymond Chow in the corruption and organized-crime indictment issued on July 25 by a federal grand jury. Jackson and Yee are accused of conducting a racketeering enterprise to solicit campaign contributions in exchange for political favors and plan an international arms deal. In a separate racketeering conspiracy count, Chow is accused along with Jackson and 15 other defendants of running an enterprise that allegedly encompassed drug sales, money laundering, gun sales, schemes to buy stolen property and a murder-for-hire plot that was never carried out. The indictment claims that enterprise was operated by an alleged criminal faction of the Ghee Kung Tong, a fraternal association based in Chinatown in San Francisco. Chow, who was previously convicted of racketeering and gun trafficking, is the dragonhead or leader of the Ghee Kung Tong. Several other defendants have not been implicated in either racketeering enterprise, so how their cases will be handled must be decided as well. It’s not clear after Wednesday’s hearing exactly how Judge Breyer plans to do so. Keith Jackson has been charged in both racketeering conspiracies, and may have to stand trial twice. 11/12/2014: The FBI may have used an unmanned arial vehicle (UAV) — or drone — to conduct surveillance operations on several defendants in the State Sen. Leland Yee corruption trial. In a recent court filing from Raymond “Shrimp Boy” Chow, one of his attorneys, Curtis Briggs, states that included among the approximately seven million computer files, lies video surveillance footage, captured by a UAV monitoring one of the 29 defendants and their family. He believes the video footage isn’t gagged — like the rest of the evidence — because the government failed to designate it as such. “This is more egregious than warrantless spying because it appears the FBI agents were also deceiving a federal judge about whether aerial surveillance was occurring at all,” Briggs told the Appeal. The FBI’s use of drones, which has been going on since at least 2006, and has been marked by controversy in terms of exactly how and why they are used — potentially raising civil rights issues. Also, the FBI has said that drones’ use doesn’t require the paperwork that phone taps, and physical searches require. In the State Sen. Yee case, Briggs wrote that thus far the government has not disclosed any drone warrants, or wire tap applications signed by a district magistrate. The news of the FBI’s use of a surveillance drone in the investigation comes amidst an important moment in the court proceedings in the sprawling federal investigation into political corruption, and organized crime. On Wednesday Judge Charles Breyer denied several motions to sever the case into smaller pieces, reaffirming that the government has correctly charged the case in one, 228 count indictment. 29 people have thus far been implicated by the feds, including suspended state Sen. Leland Yee, D-San Francisco/San Mateo and Chinatown association leader Raymond Chow in the corruption and organized-crime indictment issued on July 25 by a federal grand jury.